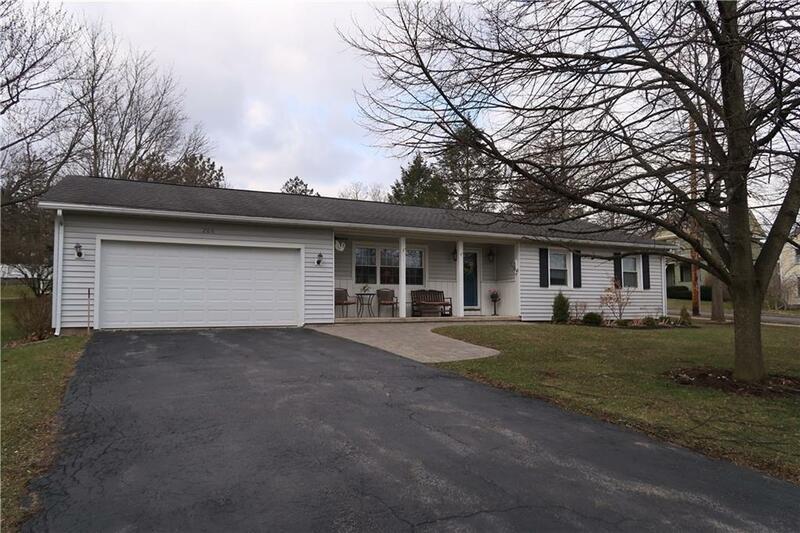 LOVELY REMODELED SPACIOUS RANCH WITH A TOUCH OF MCKENZIE CHILDS LOCATED IN THE HEART OF CANANDAIGUA. PERFECT FOR THE BUYER LOOKING FOR THAT RANCH STYLE. LARGE LIVING AND DINING ROOM WITH OPEN FLOOR PLAN. HEATED SUNROOM WITH CATHEDRAL CEILING. THREE BEDROOMS - ONE USED AS A DEN/STUDY. UPDATED OAK KITCHEN WITH NEWER APPLIANCES. NEWLY ADDED GARAGE ENTRY WITH FIRST FLOOR LAUNDRY AND LARGE PANTRY. NEW FRONT PAVER WALKWAY AND REAR PATIO. CLOSE TO BUS ROUTE AND ALL POINTS AROUND. Directions To Property: North Main Street To Gibson. Turn Left Onto Pearl Street. House Is On Corner Of Pearl And Bristol.